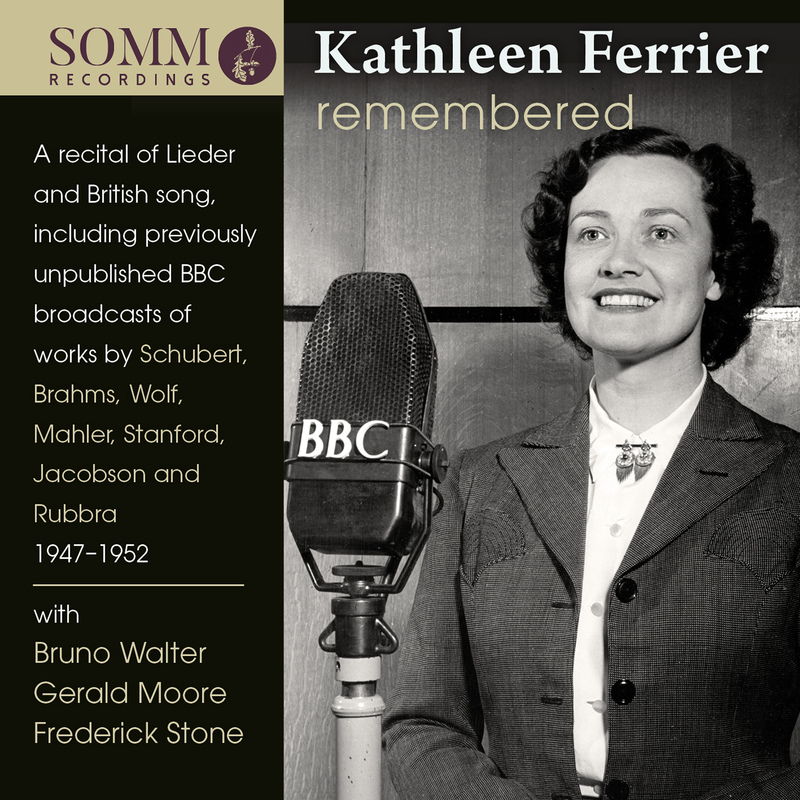 Remembering Kathleen Ferrier: A collection of German Lieder and British songs, including 19 previously unpublished tracks: 1947-1952, with Bruno Walter, Gerald Moore and Frederick Stone. Kathleen Ferrier’s legacy of recordings has been well-known and widely-admired for over 60 years. So it seems amazing that, after so long, a treasury of previously unpublished and little-circulated BBC broadcasts is now being released. In typical fashion, SOMM leads the way in remembering great composers and artists of the past and Kathleen Ferrier is one of the most divinely gifted among them. These recordings are from two sources. Several are from the BBC’s own archives and include Ferrier’s first broadcast of Rubbra’s Three Psalms Op. 61, of which she was the dedicatee, five Schubert Lieder, four by Brahms and Parry’s Love is a bable, recorded at the 1948 Edinburgh Festival, which makes a delightful conclusion to the CD. The other source is the remarkable collection of Kenneth Leech, a composer and engineer who, from the 1930s to the 1950s, recorded numerous broadcasts, mainly using Bakelite and metal discs – the usual way for an enthusiast to preserve radio programmes at that time. This collection is stored at the National Sound Archive in the British Library. These recorded performances are immensely valuable, as they allow us, so many years later, to hear several songs that Ferrier never set down commercially – including Brahms’ Nachtigall – as well as others that can be now compared with their commercially-made counterparts. So we can hear her sing Lieder by Schubert and Brahms and songs by Stanford and Jacobson which have never before been issued. Technically Leech’s discs do not match the standards of Ferrier’s Decca recordings but with the dedication and expertise of sound engineer Ted Kendall, they have been given new life and offer us a more complete view of Ferrier, the song- and Lieder- singer. It has been a labour of love to restore Ferrier’s voice in this music, which lay at the very core of her repertoire. Ferrier’s accompanists on this CD are three of her friends and valued collaborators –Bruno Walter, Gerald Moore and Frederick Stone. Their contributions to this recital are very considerable.